Isla is based on the dreams and hallucinations of three shipwrecked characters who find themselves alone and dependent on each other. Using their amazing physical skills they create unbelievable situations, choosing the most bizarre strategies to overcome the limits of their island. Based on a work of movement and body, D’click bring to life an entrancing story, incorporate the most typical tools of the circus, such as acrobatics and the Chinese pole. Isla reminds us of the subtle barrier that exists between physical theatre and dance; circus and risk, magic and dreams. 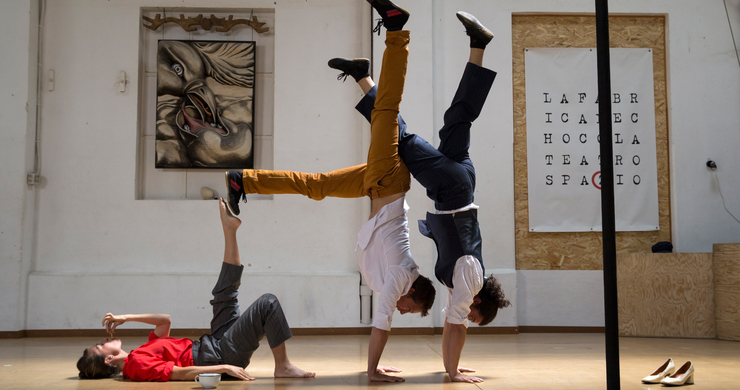 D’click, from North East Spain, have performed Isla at international festivals all over the world such as the Trayectos Danza Festival and Festival Ax Les Thermes in France. This particular show has received prestigious awards, including the ‘Best Aragonese Circus Performance’ of the Festival de Circo Ciudad de Zaragoza in 2017.